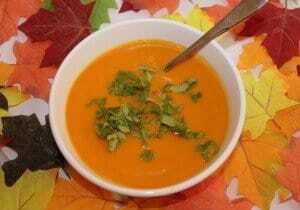 Carrot and coriander soup is very popular in Ireland. It’s lovely orange color makes it an ideal soup for fall and perfect to serve at Halloween. The flavor of ground coriander, made from the seeds of the coriander or cilantro plant, is similar to that of roasted orange peel, making it a great complimentary spice for sweet carrots. When I first came to America I did not realize that coriander is called cilantro over here. Only the leaves and stems of the plant are called cilantro. The seeds are still called coriander seeds in America, just like in India where they are used extensively. These seeds are ground and sometimes roasted to produce an aromatic, flavorful spice. If you can only find coriander seeds in your grocery, you can always make your own ground spice. First dry-roast them by heating them in a small frying pan for about 2 minutes. Move them around as they roast. They are done when they start to jump in the pan. Let them cool, then grind them with a mortar and pestle or use a coffee grinder to create a coarse powder. 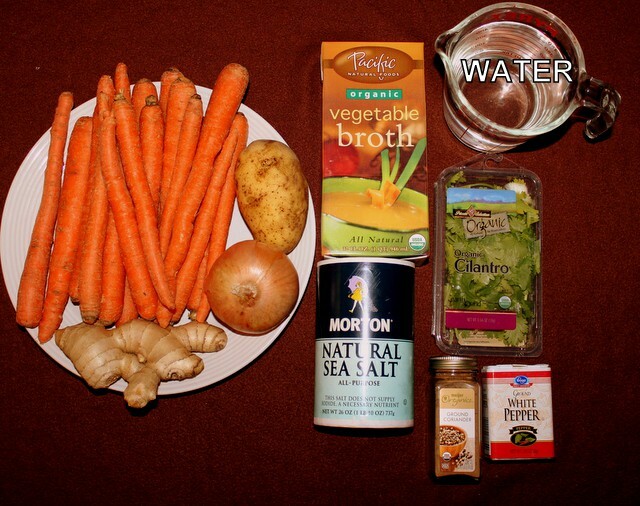 The first and most time consuming job for this soup is to peel and dice all those carrots. Once I have them all peeled I chop each carrot into three pieces of roughly equal length. 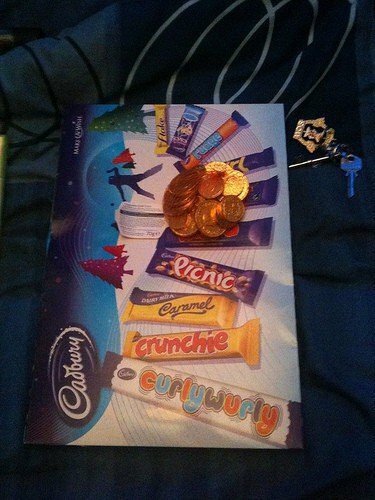 Then I cut each piece into quarters. 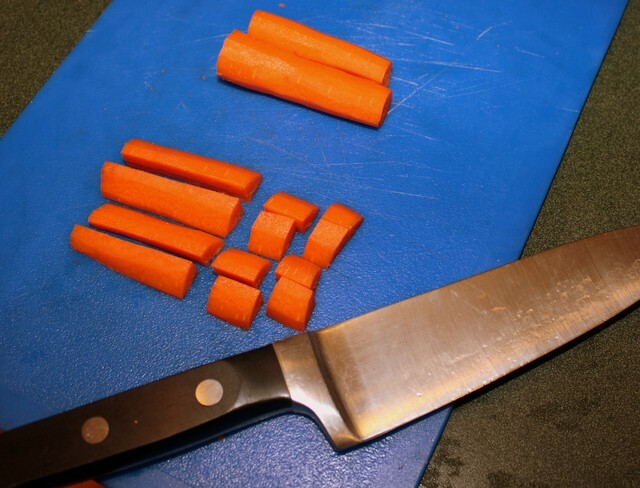 (If my carrots are exceptionally fat, I cut each piece into eighths). I line up each quarter lengthwise, then chop them into small pieces about 1/4 inch in length. 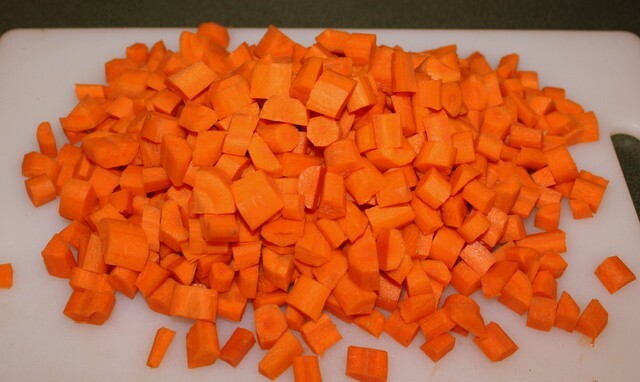 And after quite a bit of chopping a lovely mound of orange carrot pieces appears. Next heat the oil or butter in the bottom of a large pot or Dutch oven. I like to use my cast iron Dutch oven. It really is a great pot for making soups. The cast iron distributes heat evenly so the vegetables simmer perfectly. 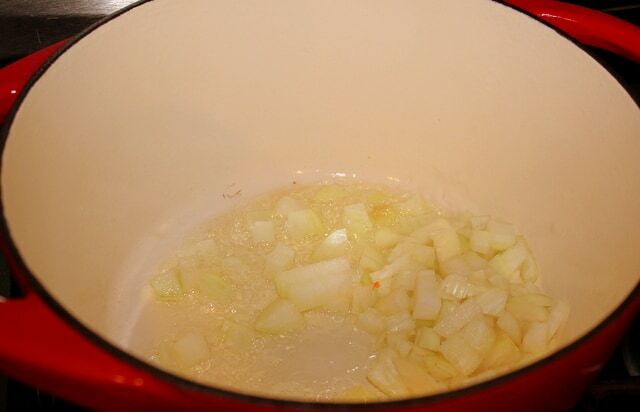 Add the onion to the melted butter and cook for 5 minutes, stirring occasionally to make sure it does not burn. Next toss in all those lovely carrots and diced potato. Using a potato in a carrot soup may seem strange to some, but I think it counteracts some of the sweetness of the carrots. I also like the way the starch helps to thicken the soup. Next, add the ground coriander, the minced fresh ginger, and the salt and pepper. Ginger is not always used in a carrot and coriander soup, but I like the depth of flavor it adds. 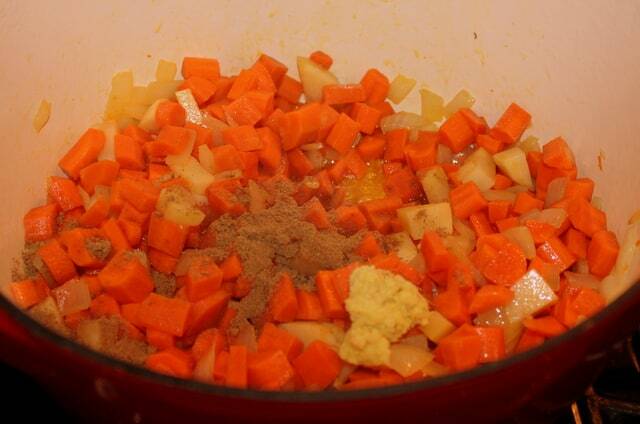 Mix all the ingredients together so the carrots are covered in butter and spice. Lower the heat. Cover the pot and let the vegetables sweat for an additional 8 minutes, stirring occasionally. 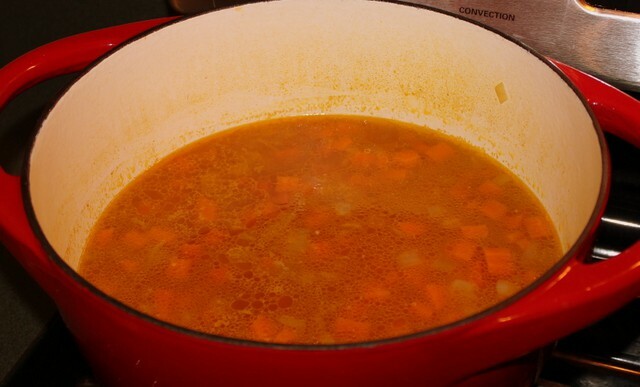 Once the carrots have started to soften, add the vegetable broth. I like to add 2 cups of water also. I find if I use all vegetable broth with the diced potato, the soup ends up being very thick when pureed. So I just add a little bit of water to prevent the starchy potato over thickening this lovely soup. Turn the heat up to high, until the soup begins to boil. Then lower the heat so that the liquid is just simmering. Cover the pot and continue to simmer for an additional 30 to 40 minutes, until the vegetables are fork tender. Stir the soup every 10 minutes to make sure it does not stick. When finished cooking it should look like this. Turn the heat off and let it sit uncovered for about 10 minutes. It’s never a good idea to puree a boiling, hot soup. Next, use an immersion blender to puree the soup completely. 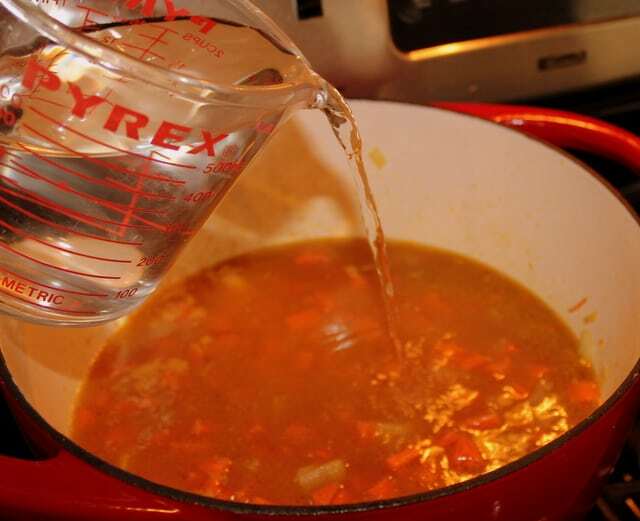 If you do not have an immersion blender, then transfer the soup in batches to a liquidizer. Transfer each pureed batch to a large bowl. Then when all of the soup is pureed return it to the pot to reheat before serving. Sprinkle the soup with some chopped fresh cilantro to serve. This is a perfect lunch on a cool fall day, with a side of crusty, buttered bread. 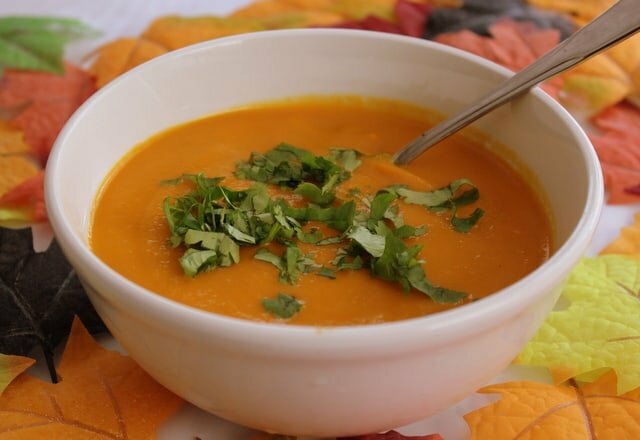 Carrot and coriander soup's lovely orange color make it a perfect soup for fall and ideal to serve at Halloween.The flavor of ground coriander, made from the seeds of the coriander or cilantro plant, is similar to that of roasted orange peel, making it a perfect complimentary spice for sweet carrots. Step 1 Heat the oil or butter in the bottom of a dutch oven and add the onion. Cook for 5 mins over medium heat. Step 2 Next add the diced carrots and potato. Toss together with the buttery onions. Add the ground coriander, minced ginger, salt and pepper. Step 3 Next add the diced carrots and potato. Toss together with the buttery onions. Add the ground coriander, minced ginger, salt and pepper. Step 4 Reduce the heat to low. Cover the pot and cook for 8 minutes until the vegetables begin to soften. Step 5 Reduce the heat to low. Cover the pot and cook for 8 minutes until the vegetables begin to soften. Step 6 Add the vegetable broth and water. Turn the heat up to high to bring the soup to a boil. Then reduce the heat to low, covering the pot and letting the soup simmer for 30 to 35 minutes until the vegetables are tender. Step 7 Add the vegetable broth and water. Turn the heat up to high to bring the soup to a boil. Then reduce the heat to low, covering the pot and letting the soup simmer for 30 to 35 minutes until the vegetables are tender. Step 8 Turn the heat off and allow the soup to cool a little. 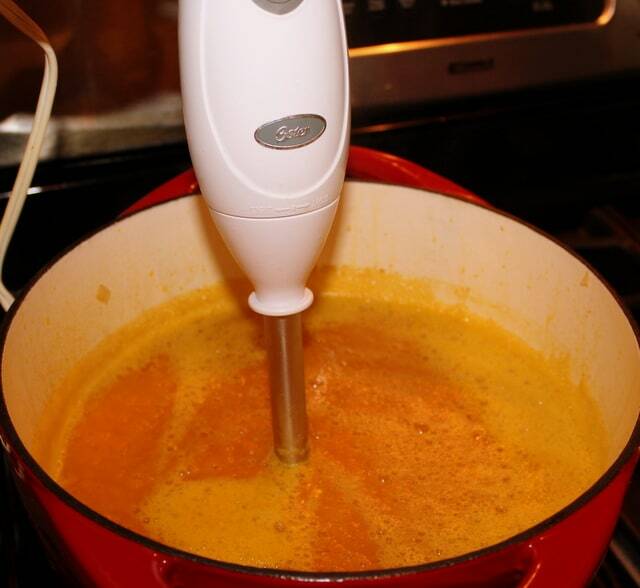 Use an immersion blender to puree the soup, or liquidize in batches. Step 9 Turn the heat off and allow the soup to cool a little. Use an immersion blender to puree the soup, or liquidize in batches. Step 10 Serve hot, sprinkled with chopped fresh cilantro leaves to garnish. Step 11 Serve hot, sprinkled with chopped fresh cilantro leaves to garnish. Wishing you all happy days of Halloween and fall cooking. Check out my complete recipe list here. So true, Vince – soup doesn’t have to be fancy and expensive,to be tasty and wholesome. Vince – they would be perfect for St. Patrick’s Day. I am constantly trying to think of ideas for green, white and orange food combinations, to try to come up with recipe ideas for St. Patrick’s Day. Thanks for the suggestion. 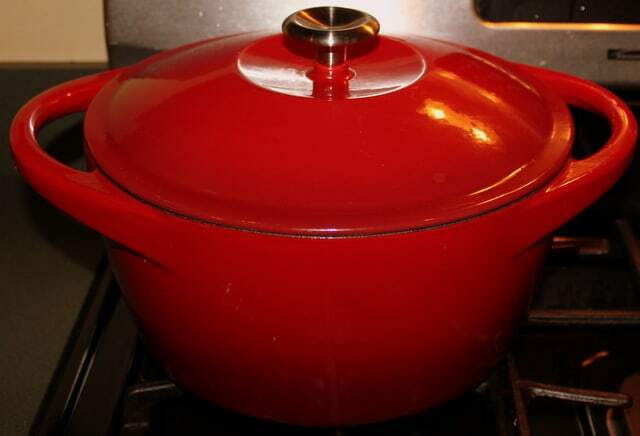 Aimee – I love my Dutch Oven – it is great for cooking soups and I also use it for all my deep frying. Thanks to Sam’s Club for that one. Take care, and thanks for stopping by once again. Glad you like this soup, Aimee. The carrots are a little sweet though. Perhaps if you mixed parsnips and carrots it would not be so sweet. I’ve never tried that, but it might work. Parsnips are also sweet though, but perhaps not as sweet as carrots. Oops, that went in the wrong place. Margaret – I make cream of mushroom and cream of vegetable soup pretty frequently, but tend to make a chicken noodle soup when using chicken. Do you like vegetables in your cream of chicken soup or do you prefer it plain like a canned version of the soup? I like to create my own recipes, so I might give cream of chicken soup a go someday. Thanks Mairead will try out the other soups. 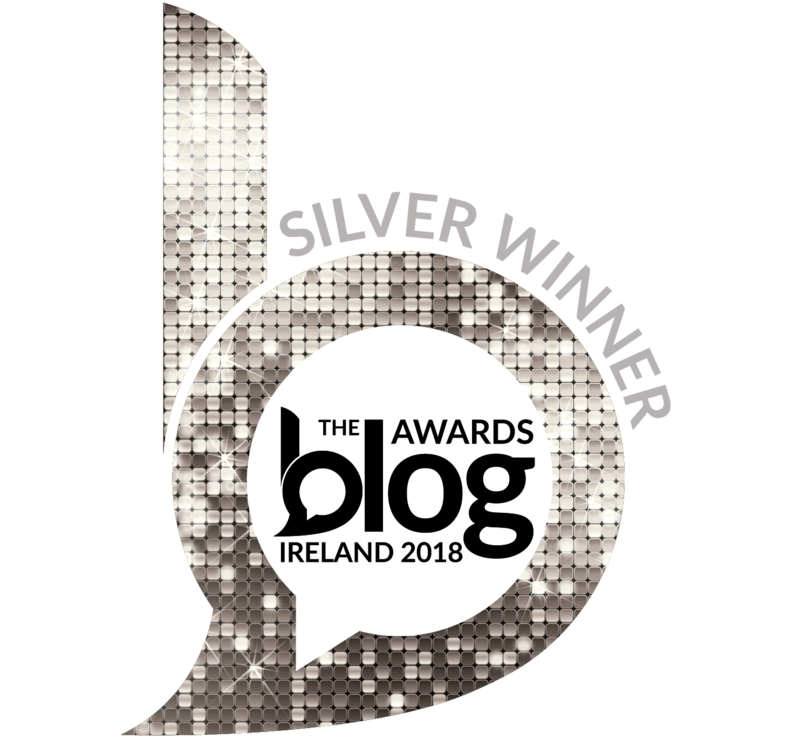 Hi Mairead can you tell me where I can find your cream of mushroom soup and chicken noodle soup I have been searching your website and can’t seem to find it. Margaret – I’m afraid I haven’t yet shared those recipes on my blog. I’ll get cooking and photographing this week and see if I can share them in the coming weeks. Do you have a trick to peeling the carrots? 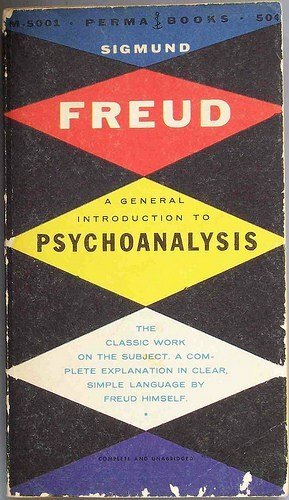 Also do you have recipe for pea soup? I tend to make split pea soup in America, but when in Ireland I make pea soup using frozen peas. Which soup recipe are you most interested in? P.S. I don’t have any affiliate agreement with Amazon right now. I just added the link since it’s the easiest way to show you my favorite peeler. Thank you for getting back to me. Good ole vegtables peeler is my choice too. My son has been asking me to help him make pea soup. I thought my mom made it but I believe she made the split pea. But I would love if you could publish a pea soup recipe as well as split pea. That way I have more to chose from. Thank you for asking. Hi Maire’ad (sorry about the accent mark)….. 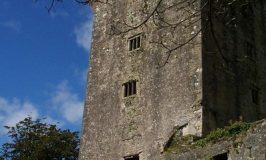 I recently visited Ireland Aug. 26- Sept. 3rd on a group tour and had an amazing time…. The food, the country, the people!! 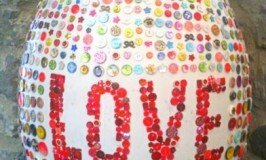 We loved it all! 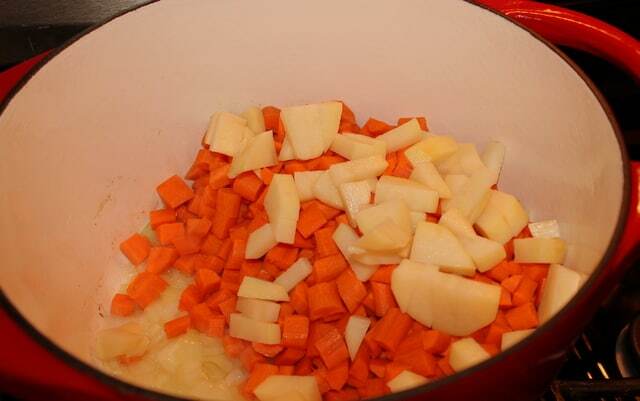 I have been on a mission to make carrot soup as I had it for the first time on a day trip to Kilkenny at a little pub called Lanigan’s Bar and I honestly wanted to lick the bowl……….. 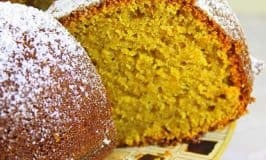 I will be trying your recipe this weekend! Hi Aundrea – I’m delighted to hear you had a lovely time in Ireland and that you discovered carrot soup in a little pub in Kilkenny. Irish soups are very tasty and I too have been known to want to lick the bowl. Happy cooking and thanks for stopping by. Love this soup. We tried it for the first time tonight, and I am thrilled to have plenty of leftovers for once. So many recipes seem to be for four people (and they don’t always double well). Anxious to try some others of your recipes. 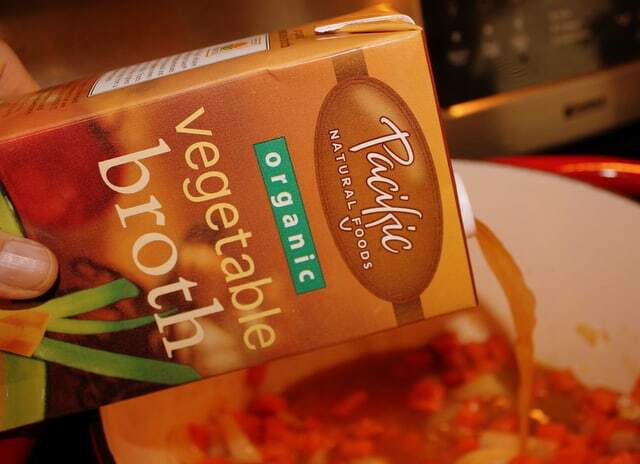 Hi Rachel – I’m so glad you like this soup – it’ a favorite in Ireland. Enjoy your leftover tomorrow.